We know you want it,the moment you see it. Why I should buy it? Every bags have their unique design,all colors are welcome . Perfect size convinent for all your needs.It's small enough to be used as a carry-on, and opens up to have a lot of room for everything you need on your work trip or vacation.You will love that you can open up a zipper to decompress the bag and allow it to fit even more into it!Last but not least,there are also many pockets! Feeling the bag not worth this price? What you see is what you get. If you don't satisfied with the quality, there's a money-back guarantee. 18.1" x 9.1" x 9.9"
So, wait no more, come and get your duffel bag right now! SUPERIOR QUALITY:Every bags are produced by our own factory,we pay more attention to every espect details,the stitching,the zippers and the straps,to reach extreme achievement contracted in noble quality. ARBITRARILY CARRYING:Comes with adjustable and removable shoulder strap,you can carry it in the way you like,handbag or shoulder bag. 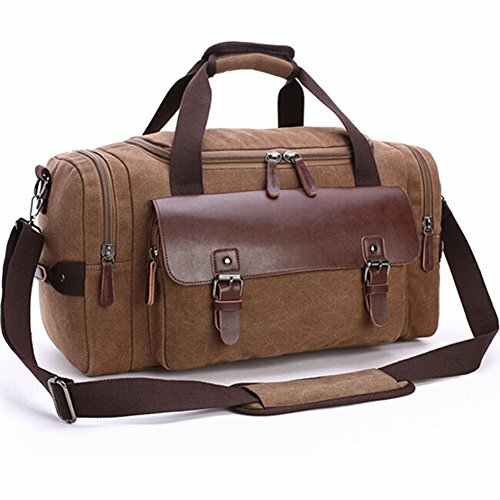 MATERIAL:High Quality Tear Resistant Durable Cotton Canvas and Waterproof Leather Accents Material,the Fabric Feels Soft and It Is Capable of Being Washed Too. ORGANIZATION:Incredibly Compact Size(18.1*9.9*9.1 inch)Unique Bottom Design Allows Your Bag Roomly,Lots of Pockets, of Different Sizes, for Storing Items That You Need to Find Quickly.With It,You Can Make Your Stuff More Organized. MULTIPURPOSE:For Gym, Sports, Travel, Luggage, on a Business Trip, Hiking, Camping,Daily Using,House-moving or Emergencies,Checked Bag,Weekend Bag,Airline Bag,Overnight bag and Carry-on Bag. If you have any questions about this product by Lady house, contact us by completing and submitting the form below. If you are looking for a specif part number, please include it with your message.